What is the most effective way to assess regional disaster resilience and measure progress? 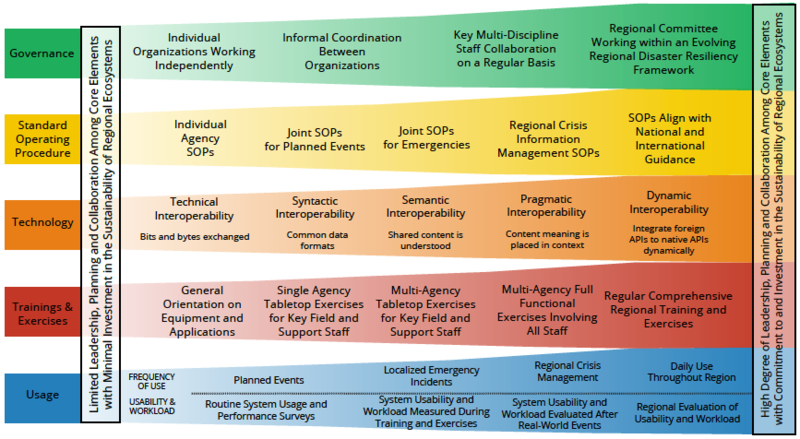 Our research posits that every element of systems interoperability is an enabler of regional disaster resilience, and arguably should become a focal point for standardized measurement of communities’ ability to work together. In a recent published academic paper, we defined systems interoperability as the ability of human and technical systems to work together. This concept is foundational to any regional effort. Systems interoperability can be qualitatively and quantitatively assessed when characterized as five forms of capital: Governance; Standard Operating Procedures; Technology; Training and Exercises; and Usage. The U.S. Department of Homeland Security developed the SAFECOM Interoperability Continuum originally used this framework to define interoperability. We have revised the continuum to apply to a broader global audience, and have updated the technology and usage “lanes” to incorporate human factors and ergonomics considerations. What do you think? In our research, we link systems interoperability and regional disaster resilience. In terms of capability maturity, the degree to which communities are prepared to be interoperable will determine the degree and speed in which communities can adapt and stabilize after a disruption. There is a lot of research on technical systems interoperability, but we are introducing a new dimension to the human interoperability conversation. Human interoperability requires that people must tune their behaviors to achieve mutual success as they work together. How well one performs in their career and personal life is influenced by both their Intelligence Quotient (IQ), an assessment of human intelligence, and their Emotional Quotient (EQ), the ability to identify and manage emotions and their impact on decision-making. Whether human systems are ready to succeed is influenced by their Capability Quotient (CQ). The authors define CQ as an assessment of the readiness posture and relative responsiveness of personnel and assets to perform a mission. The capability quotient concept is centered on the idea that an individual may be the most intelligent person in the world and have a great ability to navigate intense conflict and make the right decisions, but if they have no capability and are not postured to do anything about it, then they are no better off. Of concern is the ability of dissimilar technical ecosystems to work together to serve the needs of the community. To develop and improve an organization’s crisis information management CQ, the human, social and organizational interoperability components must be superimposed on the technical interoperability components. If you have any questions, please contact us at jthomas@spinglobal.co or asquirini@spinglobal.co.